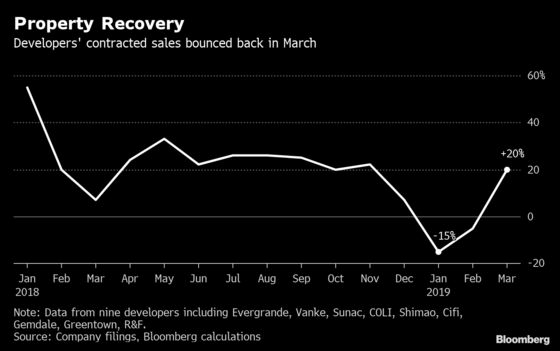 Project sales of major home builders rebounded in March after contracting in the first two months of 2019, thanks to easier financing from banks, looser restrictions on home buying and lower mortgage rates. Beijing’s move this week to encourage citizens in rural regions to move to urban areas is also a timely boost, with dozens of smaller cities being told to scrap rules on local hukou residency permits -- curbs that have been used to keep a lid on property prices since 2016. A re-accelerating real estate sector could help bring forward stabilization in China’s economy after a bruising few quarters during which trade-war doubts and a cyclical slowdown combined to brake output. 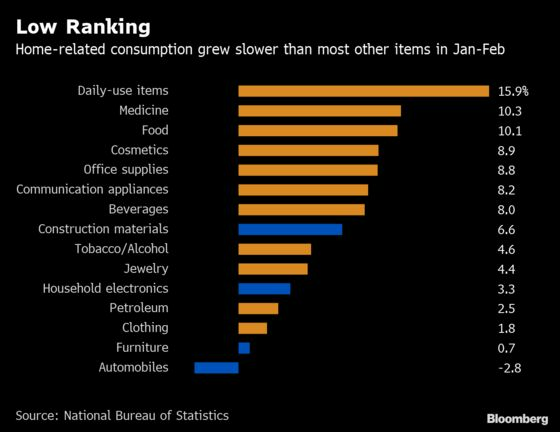 Faster home sales and higher prices have the potential to boost demand along the entire supply chain from steel to white goods. Rising land prices, meanwhile, can help top up government coffers depleted by tax cuts. Home sales in tier-1 cities jumped by 48 percent in March from a year earlier, after a 35 percent increase in February and 20 percent in January, according to China Real Estate Information Corp.
It’s a slice of good news following President Xi Jinping’s late 2016 campaign to contain financial risks and asset bubbles that weighed on the sector and in turn, on the consumption of housing-related items such as furniture, home appliances and automobiles. That had the effect of dragging overall retail-sales growth to a multi-year low. “We may see the property market stabilizing soon” if more local governments join the camp and ease property policies, supporting consumer confidence and household consumption, according to Wang Tao, chief China economist at UBS Group AG in Hong Kong. Local authorities will also benefit from the market upside with increasing land revenues, improving their funding outlook amid the most ambitious tax cut commitment in years. Funding from land sales contracted by 5.3 percent in the first two months of the year, far below the annual target of expansion at 15.3 percent, according to the Ministry of Finance. Provinces and cities are being asked to cut unnecessary spending to keep a tight balance between revenue and expenditure. While the recent guideline on urbanization won’t boost property sales directly, it does point to Beijing’s increased tolerance of local easing measures. At least a dozen cities from Dalian in the north to Guangzhou in the south have loosened restrictions for people to apply for local residency permits in 2019. Fitch had previously predicted a contraction of up to 10 percent in home-sales value in 2019. “The government wants neither a surge nor a slump in real estate, only a stabilized one,” E-House’s Ding said.